Boycotts consist of withholding business or involvement as a form of protest. 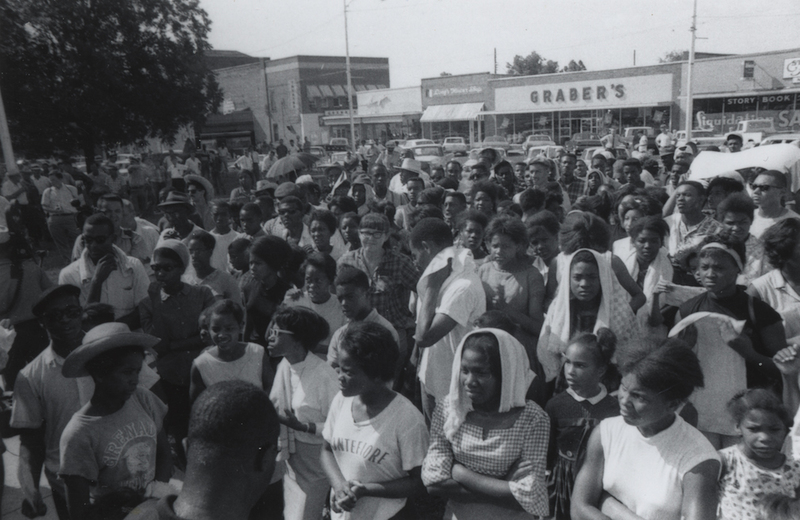 Mississippians frequently used boycotts as political tools in the civil rights movement to challenge particular forms of discrimination. Boycotts were ways of forcing issues by making situations difficult and potentially unbearable for the targeted people or businesses. Civil rights activists frequently used the phrase selective buying to make clear that they were giving their business only to people who treated them with respect or who had clearly rejected Jim Crow practices. Boycotts often began after a dramatic incident—an act of violence or insult. The murder of George Lee in Belzoni, the attempted murder of George Metcalfe in Natchez, and the murder of Martin Luther King Jr. in Memphis all led immediately to boycotts. In Clarksdale the decision to prohibit African American musicians from marching in a parade sparked a boycott. Some boycotts began as parts of broad strategies to force change, while others addressed very specific issues. The boycotts of white-owned businesses often involved grievances regarding issues outside the stores. Boycotters addressed school segregation, violence, hiring practices, the makeup of local government agencies, and other matters. In some cases boycotters demanded greater access to government. Boycotts also dramatized issues involving the stores themselves, such as the refusal to allow African Americans to eat in restaurants or to try on clothing before purchasing it. “Don’t Shop Where You Can’t Eat” was a common demand. Other boycotts involved what activists called “courtesy titles”—that is, African Americans’ right to be called “Mr.,” “Mrs.,” or “Miss” rather than by their first names. And some involved demands that stores hire African Americans in positions other than the most menial. Boycotts are intriguing forms of protest, because unlike strikes, marches, pickets, or other forms of direct action, they consist of not doing something: authorities have difficulty arresting people for staying out of stores. By not shopping, boycotters could also uphold an ideal of self-control, saying that some ideals outweighed the need for certain goods or conveniences such as riding a bus. Women were especially important in boycotts, in part because they were often the primary shoppers in their households. Ministers often made the point that boycotting was an expression of high moral principle, sometimes encouraging people to avoid spending money on new clothing for Easter or Christmas when higher goals were at stake. White Mississippians who opposed the civil rights movement responded to the boycotts in a variety of ways. Sometimes they tried to ignore the boycotts, hoping the protesters would run out of energy and nerve. Increasingly, however, authorities tried to make boycotts illegal. Boycotters in Jackson, Clarksdale, Natchez, and Greenwood faced arrest for “conspiring to commit acts injurious to public trade.” In 1966 Mississippi senator James O. Eastland suggested that the federal government should make boycotting illegal, and in 1968 the Mississippi legislature passed a law prohibiting certain types of boycotts. Business leaders in Port Gibson and Vicksburg sued activists, including the National Association for the Advancement of Colored People, for money supposedly lost because of the boycotts. Some white Mississippians used organized boycotts against groups they felt were becoming too friendly to the goals of the civil rights movement. Americans for the Preservation of the White Race, a small group organized in Natchez in 1963, condemned and sometimes boycotted businesses, especially national chain stores without strong Mississippi ties, that changed their traditionally discriminatory practices. Prominent civil rights boycotts in Mississippi included Belzoni, 1955; Jackson, 1960, 1962–63; Clarksdale, 1961; Canton, 1964; Issaquena County, 1964; Sharkey County, 1964; Natchez, 1965–66; Greenwood, 1965, 1968; Edwards, 1966; Grenada, 1966; Port Gibson, 1966; Fayette, 1966; Indianola, 1968; Rosedale, 1970; Vicksburg, 1972; Holly Springs and Byhalia, 1974.